Copic Knitting? This just makes me giggle 😉 Love the little nautical scene you created on your second card. Love the scenes you built -adorable cards! Your artistry is outstanding! I love monkeys and the ocean….my spirit would soar if I could win one of these great stamp sets!!! Great cards. Thank you for sharing your talents! Fabulous productions! You are the one to learn from to advance. Wow! I love the way you incorporate the stamps into the card designs! Amazing cards perfectly showcasing new products. This release is great and I can’t wait to get my paws on some wonderful stamp sets and dies! Sandy I love visiting your blog. You are so informative and clever and a wonderful kind person to boot. Super cute cards! I just love those cute little stamps from the Bear Ware set! Love the Sock Monkey holding the bunny, so cute and fun. Such a cute ocean scene! So impressed by the coloring. And I can’t get over how cute the sock monkey is! Thanks for sharing your awesome cards! Love how beautifullyou perfect you create scenes on your cards. LOVE!! That sock monkey is so so so cute! Love both of these but I am so excited for new things for that bear to hold 😀 Love the fish! I love your cards Sandy!! I make sure I watch all your videos to get tips on colouring! Just love love love the bear and the monkey. Sandy, I love everything you do. The coloring on the monkey is great and my fav is the bear, Thanks for the ideas. The sock monkey comes to life with your skillful coloring. Thank you for sharing your awesome skills. Both cards are just wonderful! Always so fun to watch you color and paint! And the release is amazing, too! Great cards, Sandy, fun too!! In British Columbia, Canada, our sock monkeys are made out of mens thick grey work socks and they have red heels. Makes for a real cute monkey. Love your “knitting” on the bear and bunny. Sandy, your talent is amazing. I LOVE both cards. You make it seem so easy lol. Thank you so much for the great inspiration. These are such cute cards. I love the little bear and seagull. Love these stamps! I’ve had the basic bear stamp/dies on my wish list for ages. Now I have to add more LOL. So little time, so many fun toys. Great cards, and great teaching — thank you so much. As one just entering the wide world of watercolors, I really appreciate the hints you offer, and the skill you demonstrate. These cards are amazing & love to watch your tutorials & technique in action. I learn something new every time!!! These are both so amazing and the colouring of the sock monkey look incredible!! Great cards! I love how you explain why you’re doing certain things i.e. waiting for one section to dry before working on the adjacent section/turning the image upside down, etc. Thank you for the video. I think the bear is really cute, might have to add him to my wishlist. Oh, my GOSH!!!!!!!!!! The bear, the sock monkey, TOO CUTE! I’m always blown away by your shading and shadows. you make it look so easy! Hmmm….if I follow your instructions, would it be legal to answer ‘Yes’ if anyone asks me if I’m a knitter? I’d best get out my copy of the Crafting Guide To Law and Laughter handbook. Here’s hoping you’ll bail me out if there’s a problem. Thanks for the inspiration! OH MY! these are colored flawlessly!! Hi Sandy! Two more gorgeous card projects. I know already that I am getting that sock monkey. My hubby was just telling me about one he had as a child! 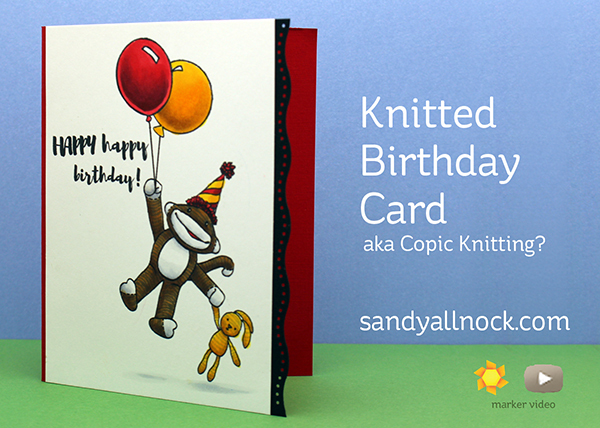 Naturally, I have to surprise him with a sock monkey card! This release looks fabulous! Cute cards! I especially like the sock monkey. Your cards are little works of art! Just beautiful. Thanks for the inspiration. Both of your cards are fabulous, Sandy! The scenes you created are wonderful! I’m always amazed as I watch you share your talents. Thank you for your display of beautiful cards and of course these 2 amazing designs are no different. I appreciate your sharing what you know about coloring so we can all make pretty cards. I love to watch your YT videos, you are SO very talented! And I love your sock monkey card! Too cute! Cute cards. 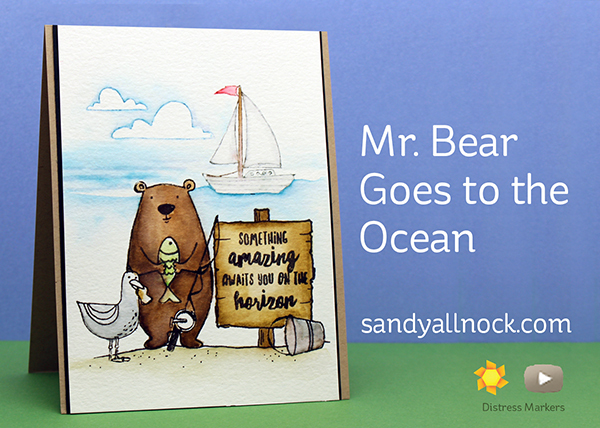 I love the Mr Bear goes to the ocean! Beautiful cards! I like your creative style. Wow! Both cards turned out great!